Hi, guys. I’ve decided to give you a recipe with less butter! See, I do care about your cholesterol. I try to keep things around here balanced, and I noticed a proliferation of sweet treats. Well, it’s time to eat our vegetables. And fruit. Together. All at once. In one happy, white jumble. 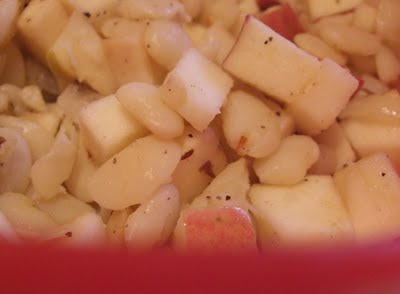 This side is super easy and an unusual combination of flavors: lima beans and apples, with some ground black pepper and red pepper flakes for spice. It’s a delight to me, as a home cook, how the omission and addition of ingredients can tip a dish from savory to sweet, and vice versa. Drop the limas, onion, and garlic. 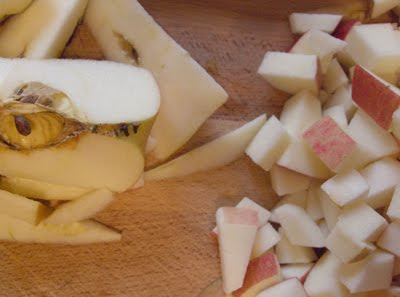 Apple plus pepper, add molasses, ginger, flour, cloves … and you’re on your way to something gingerbreadish. A lightly smashed garlic clove lies on the cutting board. 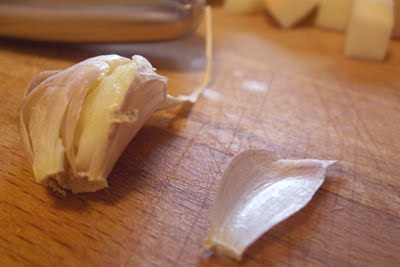 My favorite way to peel garlic is to bash it beneath the broad side of a chef’s knife. It makes a satisfying pop, and the skin slips right off. Drop the apple. Limas plus pepper, onion, garlic, lemon juice… and you’ve got a a bright vegetable side dish. Hold up. Don’t drop anything. Trust me, this combo works. The tart, crunchy apple is a crisp counterpoint to the creamy, starchy limas. And the spices and a wee bit of fat (OK, there’s some butter) bind everything together. Sounds weird, tastes good. And this dish is pretty good for you — lots of fiber, thanks to the beans and the apple skin. I have a a couple of notes, though. First, the recipe is generous; it probably serves six. I think it would be hit at a vegetarian party. Second, the leftovers are not very good. The apple gets mushy. This is why you should take this dish to a party. Instead of baking yourself into oblivion with apples, consider this healthy detour. I love the different colors and textures of white in this dish. It reminds me of a bridal bouquet. This is a fabulous cookbook from a fabulous radio program, “The Splendid Table.” Do yourself a favor and subscribe to the podcast. The tagline for the show is, “The show for people who love to eat.” Uh, that’s me. The show’s host, Lynne Rossetto Kasper, is so welcoming and good-humored. When I say dry beans, I don’t mean the hard little projectiles — not at this point in the recipe, anyway. I’m talking cooked dry beans (rehydrated, I guess). Dry beans are easy and cheap. First, sort the beans on a tray and pick out questionable elements (funky-looking beans, little stones, inedible bits that could be unpleasant if chewed). 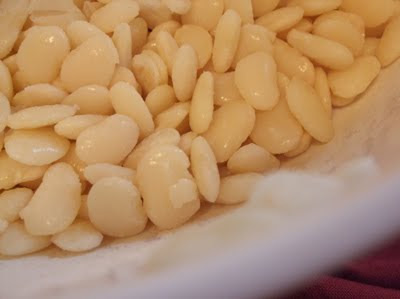 Then, soak them overnight with an equal volume of water (i.e., 2 cups beans to 2 cups water). The next day, drain the beans, cover them with about 2 inches of water, and bring to a simmer. Check after 25-30 minutes. I tend to overcook my beans. You can cook them to any softness you please. Season the beans with salt, ground black pepper, and red pepper flakes. Stir in the apples and serve.